My competition season this year is best summed up by the phrase: 2nd Place. Regardless of my two 2nd Place rankings this year, the first one in my height class of 12 women at the Yorton Cup and the second from this past weekend in the Masters Over 35 division, I feel like I won as I enter the off season this time. See the difference is that this year I cheated. I’ve been waiting to tell you this so that you didn’t judge me down when I got on stage, but it’s finally time I spilled the beans. I cheated, and I don’t regret it, AT ALL. I know that there would be some consequences to cheating and that my physique might not look as good this time, but to me, it was worth it. No I didn’t take HGH hormone or a performance enhancing drug. I didn’t befriend a judge on the panel. I ate some of my daughter’s peanut butter and jelly at times when she was done with it and it was about to hit the trash can. I had a cookie once a week or so when I really wanted it. I made my husband a new recipe for dinner and I had a couple of bites, even the lasagna (and damn that was good). I cheated on my diet. I made an intentional decision this year to cheat to protect my mental state and to attempt to achieve balance in a sport that demands extremes. There’s a quote that I read this year that stated, “You can’t be both elite and balanced.” We’ll this season, I wasn’t elite, but balance was of paramount importance to me. See here’s what you don’t see when my competition season ends. The reverse dieting battle that I face post show is about a thousand times more difficult than prep. When you diet for 3-4 months and couple that with additional cardio sessions, your body gets stressed. I am not sure what my body fat is today, but my guess is around 14%, having started this season at 21%. When the show ends and I am “out of food prison” as I typically call it, I struggle with eating clean versus eating all the foods I’ve missed during my training season. Simple things like BREAD are a no-go when you’re trying to drop 20+ pounds in 12 weeks. I have failed at reverse dieting twice. As a former anorexic and bulimic in high school and a few years in college, sometimes my desire to control my food leaves me out of control. When I stepped off stage in May of 2017, I weighed 124 pounds. Two months later on my 5 year wedding anniversary trip to Vegas, I was up to 142 pounds. IN TWO MONTHS. I thought I learned my lesson. Went back into prep that August, won my pro card at 121 pounds, stepped off stage and was back up to 141 pounds by January, AGAIN. Another 20. I am not shaming myself or my body at that weight. Quite frankly, it didn’t bother me this off season at all. I was able to lift a lot and my energy was fantastic, but getting up to my top weight of 146 this year, I made a mental promise to myself not to let it happen again. I’ve got very good at embracing the grey this past off season. It a phrase that I teach to the women I coach in my private groups. It’s about being okay with not being perfect, and that attempting perfectionism only backfires on us into a pattern of unhealthy eating and endless vows to “get back on track” by Monday. It took a lot of practice, but I now embrace this mentality. I can eat 1 cookie, even a half a cookie and get right back on track that same day without seeing that detour as that I “cheated” on my diet. It’s why I have been a macro counter for years. It works for me. My husband’s birthday cake, a week out from my last show? Yep, I ate some on Sunday and on Tuesday last week. Did it affect my physique? Not sure. Maybe I would have gotten first if I hadn’t but at the end of my show this past weekend, I wasn’t shoving donuts, candy and cake in my mouth like some of the other girls backstage. I drove to Cava in Alexandria for a big salad with lamb meatballs, and of course had some corn bread. I started my reverse diet yesterday with a whole new outlook. I don’t have urges for any forbidden foods. I’ve already had them all this time around. It’s still going to be hard as hell as I slowly introduce calories and my metabolism revs up telling me to eat more. I have to slowly eat more and I cannot revert to my normal 2000+ calories a day right away. But I have set myself up for success with a new reverse dieting coach and a completely different mindset this time. Why am I telling you this? Because I want you to “embrace the grey” too. Practice moderation not perfection. Perfection is a defect, not an asset and life is too short to live without chocolate chip cookies once in a while. I cheated this competition season, and I don’t regret it one bit. Maybe you’ll allow yourself some cheats to as you heads forward into your goals. They may set you back a little, but life isn’t a race to the finish line of fitness, it’s enjoying the journey along the way. It’s “Monday Motivation,” a catchy hashtag that social media came up with to get people to post pictures of what motivates them. Right now there are close to 12 million photos on Instagram with the hashtag #mondaymotivation. These photos range from quotes to posed selfies with people making duck faces, meal prep pictures with containers lined up full of food for days, then a random picture of someone’s dog just for kicks. People tell me that I motivate them. I’ve had random people approach me in public over the past few weeks tell me that they follow me and that I am inspiring to them. I often get emails and texts relaying the same message. They’ve told me I inspire them to get up at 5am to do fasted cardio, to meal prep on a busy weekend, to pack your food when you head out to a social event, and eat it cold in the car. I ate shrimp and cold vegetables in the car this weekend during halftime of the Navy game, when my daughter and I sought out a brief reprieve from the rain. Plan. Prepare. Succeed. To those people I just wanted to say thank you. Thank you for taking the time out of your day to send me a message or a note of encouragement. I know I wrote a blog last week about how I almost quit, well let me tell you I have almost quit this prep about a thousand times this summer, and when I was about to give up (due to perceived lack of progress), I thought of these people, some clients, some random followers on my Facebook or Instagram accounts, and I remember that while it is not my job to motivate others all of the time, I do motivate people. And that is a privilege. I always keep in mind, however, that at the end of the day, no one else wakes up and thinks about MY GOAL each morning but me. My 3-year old wants to know what’s for breakfast, and my husband has already been at work for at least an hour preparing for his next opponent. I am the one who gets on the scale every few days and analyzes the lines in my delts to make sure they are more pronounced than the day before. I am the one who thinks about my shows constantly and “will I be ready” crosses my mind at least a hundred times a day. It’s why I have a constant reminder to myself on the home screen of my iphone, staring at me all day, “Don’t let her down.” I do this for me, but I am glad that as a byproduct it helps you. Be your own motivation. Don’t do it for your kids. Don’t do it for your spouse. They care but they don’t. You are the person staring at yourself in the mirror each day. Work hard and make you proud. People won’t understand and it’s not your job to make them. Protect your goals because no one’s going to do that for you. A few spots remain for my Advanced Programming & Nutrition Group which begins next Monday. If you’re looking for a sign, this is it. Take that next step towards a stronger you now. My health is my wealth and today I’m a millionaire. For that I am grateful. Why I almost quit, but I didn’t. The hormone that may be hindering your weight loss. My daughter and I hit a rough patch in August. We returned from the beach where we spent a lot of time this summer, transitioned her away from her pacifier and my husband went back to work full-time, working from 7am-9:30pm for the first three weeks of August. We were used to this camp schedule which takes place at the beginning of every football season, so we anticipated the change…I thought. My daughter took it hard. “Where’s Daddy?” all day everyday. I took her to his office during this transition, so they could spend 45 minutes together some days when he had a break, but of course that was not enough time with her best buddy. Her behavior became almost unbearable at times, and there were many days I spent crying on the sofa after she had yet another tantrum. I did not know who my child had become. I had never seen her act out like this before. Was my newly 3-year old really a threenager? 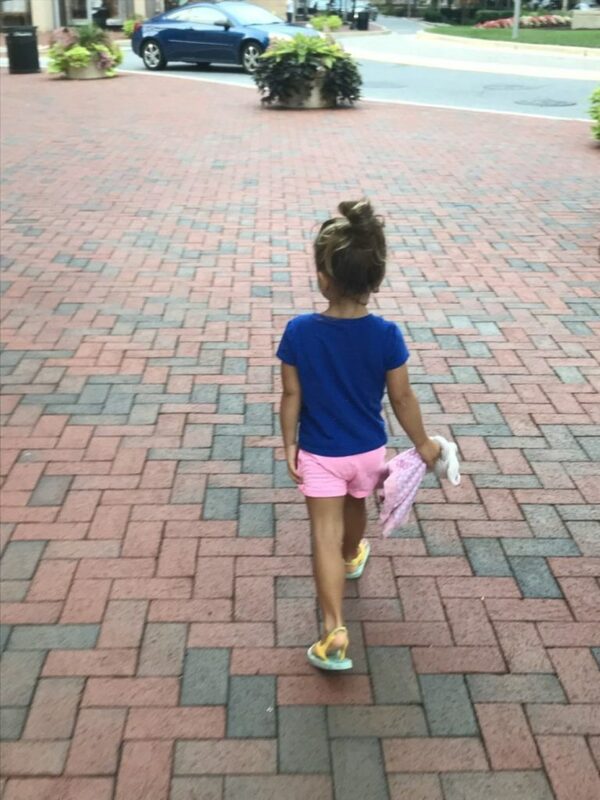 After many of her episodes, doing my best to hold it together with calm responses but failing often, I would ask her, “Gianna what is WRONG?” Her answer was always the same, “I MISS DADDY.” Finally camp ended, Justin was around a bit more, and her outbursts slowly dissipated. I made a very conscious effort to spend more time playing when I was not working instead of doing mundane tasks like emptying the dishwasher and doing laundry. I also read the book, “The Whole Brain Child” by Dr. Dan Siegel which helped me to understand how her brain was working at this stage of her life. It gave me some strategies to help me respond better during conflict. During this time, my progress for my shows this fall had stalled. My body was physically changing as I made changes to my diet and training, but my weight would not budge. Some days I would burn over 2500 calories in normal living and exercise (according to my Polar A370 activity tracker), eat only 1400 calories and wake up the next day the same weight or more. This went on for weeks and for the entire month of August my weight fluctuated between 142-144 pounds, never getting lower. I reached a low point where I laid on the sofa one day with no motivation to do anything. Things I loved to do like training and teaching my spin classes no longer excited me. I knew something was really wrong, and I was pretty sure that cortisol was to blame. “Think of cortisol as nature’s built-in alarm system. It’s your body’s main stress hormone. It works with certain parts of your brain to control your mood, motivation, and fear.” I knew that stress was preventing me from making progress. I am a big believer in following good orderly direction (no coincidence that the acronym is G.O.D.) in times like these when I’m at a crossroad. Part of me believed that maybe it was time to stop competing. I had already made some significant changes to my body, and I was happy with how I looked, having no desire to lose more weight. I had found a great balance with food after a nice off season, enjoying small treats but rarely going overboard. I felt great. Why did I need to keep going, keep losing, for the stage? But then the other competitive side of me knew I still had unfinished business to attend to before I gave up the sport. I decided to gave it one more week. I hit my favorite yoga class, got a massage, TALKED about my stress instead of bottling it up inside per my usual m.o., and during that same time my daughter’s behavior started to return to normal. I also added an adrenal support supplement to my arsenal of vitamins and got a big boost of food in my diet on Tuesday last week (a refeed day where I got to eat 250g of carbs after a heavy leg day). This past weekend, I woke up at my lowest weight this prep 139 pounds. I had broken through the wall, and more importantly, I felt different inside. I’ve finally found my stride, and I’m ready to move forward over the next 6 weeks to hit my goal weight for my first show. If you are struggling with your fitness goals, I suggest that you check your stress levels like I did. “It can derail your body’s most important functions. It can also lead to a number of health problems, including: anxiety and depression, headaches, heart disease, memory and concentration problems, problems with digestion, trouble sleeping and weight gain.” (according to WebMD). Take a moment to laugh, take a walk, talk about what’s going on inside. Let stress go so you can move forward into your goals. That’s what I did, and onward we go.